Home» TS GO's | TS Latest G.Os | TS Latest Job Notifications | TS LATEST UPDATES » TS Medical Recruitment Jobs Notification as per G.O.NO: 89. TS Medical Recruitment Jobs Notification as per G.O.NO: 89. TS Medical Recruitment Posts for Dental Assistant Surgeon / Staff Nurse / A.N.M - MPHA(F) / Assistant Professor/ Tutor / Lecturer Radiological Physics / Lab Technician Grade-II / Pharmacist / Assistant Librarian / Physiotherapist Job Notification as per G.O.NO: 89 , TS G.O.NO: 89 Dated:13.07.2016 Medical Post Recruitment Various Jobs Notification / Online Application / Impartent Scheduled Download. 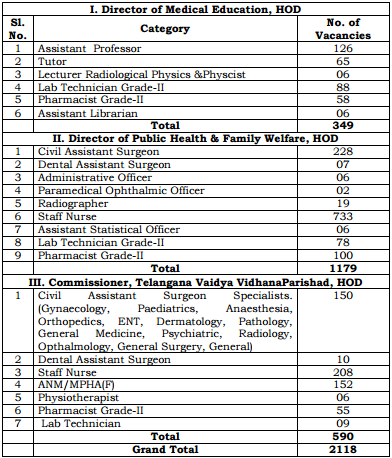 TS Public Services – HM&FW Department - Recruitment – Filling of (2,118) two thousand one hundred and eighteen vacant posts in Health & Medical & Family Welfare Department through the Telangana State Public Service Commission, Hyderabad – Orders – Issued. The Secretary, Telangana State Public Service Commission is requested to take necessary steps for filling up of the above vacancies through direct recruitment by obtaining the details, such as local cadres of the vacancies as per the Presidential Order (zone/ district etc., as applicable), roster points, qualifications, department guidelines etc., from the concerned authorities and for issue of schedule for recruitment and notification by the Commission accordingly. The HM&FW Department and the Heads of Departments concerned shall furnish details of all vacant posts authorized in this order, including the local cadre wise vacancy position, roster points and qualifications, department guidelines etc., to the recruiting agency immediately under intimation to Finance Department. The Department shall issue necessary amendments to their service rules / Government Orders as regards recruitment procedure / recruiting agency, wherever necessary, before issue of notification.